Learning to swing is hard at first but becomes more natural with practice. Golf is a game that you can play for most of your life. It's also a game that anyone can play. Making a golf swing, however, is challenging for beginners. It is a skill that takes a bit of practice and instruction to learn. As a beginner, focus on learning key fundamentals. After learning these fundamentals, making a golf swing will be something you can do with ease. Grip the club with your left hand first (if right handed). Hold the club in your fingers rather than your palm. Your left thumb should sit slightly on the right side of the grip and you should create a "v" between your thumb and index finger that points to your right shoulder. 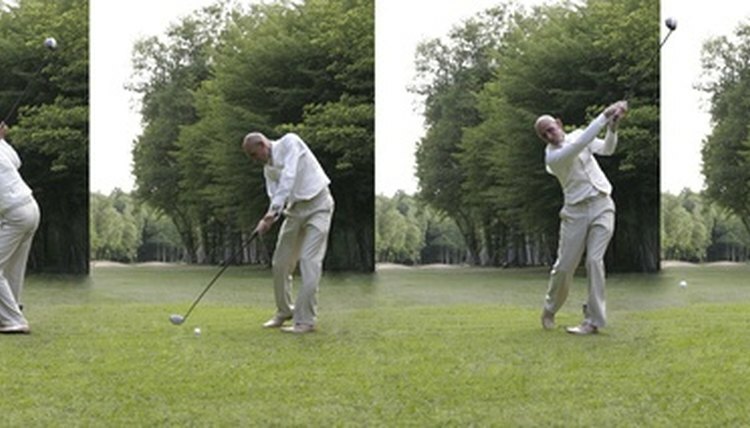 Keep the club face square (facing the target) as you put your right hand on the handle. Hold the club in your fingers with your right thumb resting on the left side of the handle. The "v" of your right thumb and index finger should point to your right shoulder. Set up to the ball with your feet shoulder-width apart. Your feet, hips and shoulders should be aligned parallel to your target line. Position the ball six inches inside your left heel with a seven iron. For longer clubs, position the ball closer to your left heel. Push your rear end back and tilt your spine forward at a 45-degree angle. Your back should be flat, not rounded. Flex your knees slightly with your weight equally distributed on both feet. Swing the club back by turning your shoulders and letting your right elbow fold slightly. Keep your feet flat on the ground as you turn your shoulders back. Rotate your shoulders to 90 degrees with the club positioned over your right shoulder. Most of your weight should be on your right foot at the top of the backswing. Swing the club back down toward the ball and begin rotating your body toward the target. Your weight should be shifting back toward your left foot. Hit through the ball and turn your body to face the target. Finish your golf swing with your belly button facing the target and your weight on your left foot.